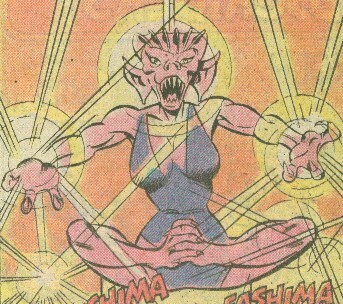 Powers/Abilities: Fashima has powerful psychic powers, enabling it to possess and control others. She could grant superhuman powers to her hosts, including firing energy blasts, etc. Her agent, Asmodeus Jones, was powerful enough to stand up to the entire regiment of Defenders. History: Fashima and the other demons of the Six-Fingered Hand would be considered Class Two demons by the standards of the OHotMU, meaning that they are originated from or are closely associated with Earth, but that they come from a much later time period than the Elder Gods. Next to nothing else is known of his past. (Defenders I#99 (fb) - BTS) - Some of the major demons of Hell--Mephisto, Satan, Satannish, and Thog--decided that by forcing Strange to continue teleporting about the globe, they could shatter the barriers between Hell and Earth and merge the two realms. To this end, Mephisto took the form of the lesser demon Maya, and gathered five other lesser demons-Avarrish, Fashima, Hyppokri, Puishannt, and Unnthinnk--to his side. The major demons told the lesser demons portions of their plan, and led them to believe that they would gain worlds to rule. Maya and the six demons named their coalition the Six-Fingered Hand. (Defenders I#96 (fb) - BTS) - As part of the above plot, Fashima allowed herself to be summoned by Felix Palmer, who then arranged the possession of musician Asmodeus Jones. She instructed Palmer and Jones to travel the country, recruiting followers and transferring to Fashima power drained from groupies. (Defenders I#96) - Jones continued his tour and power transferral, but drew the attention of the Ghost Rider, as well as Dr. Strange, who teleported the Defenders to investigate. Ghost Rider and the Defenders teamed up, and when Jones began to perform the ritual to transfer the souls of the entire audience into Fashima, Ghost Rider posed as an agent of the Six-Fingered Hand, declaring that they had decreed that Jones must die. When Jones fought back, the Defenders joined the fight against him, causing to rapidly drain power from Fashima, banishing the demon. As punishment, the Hand took Felix Palmer. (Defenders I#98) - Unnthinnk further damaged the fabric of reality, leaving the nexus in the Man-Thing's swamp in an open position. Strange led the others to probe the nexus, and found themselves pulled into a realm of Hell, where they were confronted by the full membership of the Six-Fingered Hand. (Defenders I#99, 100) - The Defenders fought against the Six-Fingered Hand and their demon legions, who were much more powerful in their home dimension. The struggle went back and forth, until suddenly five of the six members began to dwindle in size and power, leaving only Maya standing tall. Maya revealed himself as Mephisto, who siphoned the accrued power of the lesser demons into himself and his other three allies. Satan, Satannish, and Thog revealed themselves, and showed the Defenders that their demon legions were pouring through open portals all over the Earth. The major demons revealed the merger of Hell and Earth was not yet permanent, and challenged the Defenders to a series of duels: Each of the major demons transported himself, their legions, and a few of the Defenders to a scene similar to a period of one of the Earth's wars. The Defenders were challenged to "find the light in the darkness." The Defenders would seem to grasp the hidden meaning and "find the light" and then the major demon would blow everything up. Ultimately, all were reunited and brought before the four demons again, who revealed that their battles had exhausted enough time that the merger between the realms was nearly complete. However, Daimon Hellstrom, the Son of Satan, found "the light in the darkness" by deciding to stay by his father, Satan's, side. In exchange, Satan reversed the merger and sent the Defenders back to Earth. Comments: Created by J. M. DeMatteis, Don Perlin, and Joe Sinnott. Perhaps in the Marvel Universe there was a reality TV program called the Palmers, featuring a drug-addled, speech impaired, burnt out Ozzie Palmer. Asmodeus Jones is pictured in the Six-Fingered Hand an entry in Mystic Arcana: The Book of Marvel Magic. The brother of Felix, he took the stage alias of rock musician Asmodeus Jones, and his mother arranged things so that he gained demonic power from Fashima, in exchange for performing perverse rituals to transfer power from his fans to Fashima. However, he was duped by the Defenders and Ghost Rider into drawing too much power from Fashima in battle with them, and he severed the connection with Fashima and lost all of his power. He could fire powerful energy blasts and survive attacks from the combined might of the Defenders and Ghost Rider, as well as transfer power to Fashima via specific rituals. Brother and manager of Ozzie/Asmodeus, he arranged the union with Fashima, though he and his brother became progressively more hostile towards each other as the deal went on. However, when their plot was thwarted, Palmer willingly paid the price, vanishing under the gaze of the Six-Fingered Hand.